Clearly Full of Faith, The Likes of Which I Have Never Seen | Reinvigorate Your Dream! ← A week in Rwanda – Where do I begin? I now begin part two of my journey to Rwanda. I have returned and this is the part of the trip where I share the amazing experience with you. Along the way, I will try to be as “matter of fact” as possible. I will try to announce in advance all opinions and views. In some cases, the awe I felt was so overwhelming, the lines sometimes blurred between the “what is” and my response to it and I might confuse the two. I request your forgiveness in advance when this happens. I have made every aim to be as short and concise as possible. As I began to write, I realized that focusing too much on brevity would greatly devalue my present experience of sharing. Also, there is a great deal of reference to Catholic services. My intent is not to promote a religion, but rather to convey the depth at which the people of Kibeho (and all pilgrims to Kibeho) feel about their faith and the way they celebrate it. I previously conveyed that my sense of connectedness to the Roman Catholic church is not as strong as it was in my youth when I attended Catholic schools and regularly attended services. And still, I was very moved by what I witnessed during our visit. Regardless of where you are in your relationship with your faith or belief in a deity, there would be no denying the power that faith has on the pure joy in the hearts of the people of, and the pilgrims to, Kibeho. For me the experience was simply magical. One final pre-note: the use of the word poverty herein will refer to material poverty. In terms of the less tangibles, what I witnessed was anything but poverty. 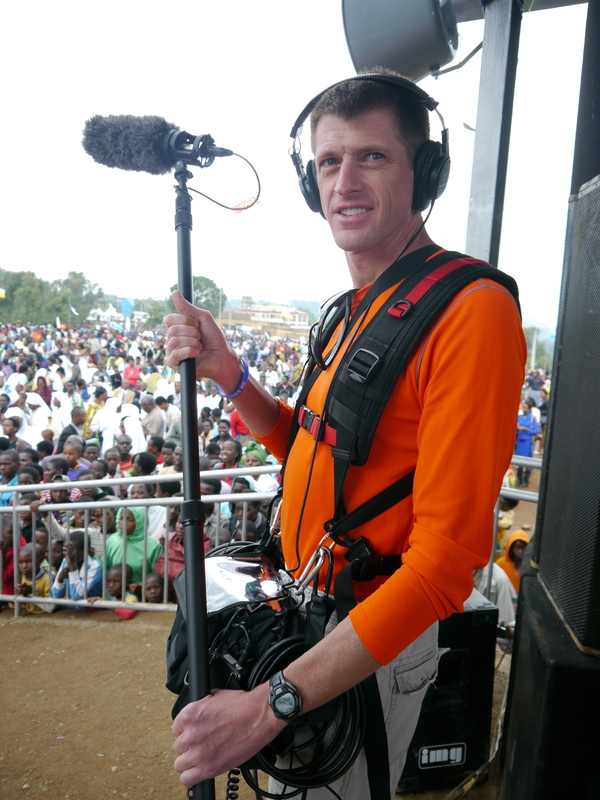 As a reminder, my trip to Kibeho, Rwanda was for the purpose of assisting a friend of mine working with Immaculee Ilibagiza in the recording of a documentary of the events surrounding the 30th anniversary of the Marian Apparitions in Kibeho, and the celebration of the feast of Our Lady of Kibeho. On November 28, 1981 the first of several Marian Apparitions occurred that would continue for the remainder of the decade. Initially there were three visionaries and eventually others. However, not all have been officially approved by the Holy See. It has only been ten years since the Vatican has recognized the apparitions of the first three visionaries. After 27 hours of door to door travel we arrived in Kigali, the capital city of Rwanda on Saturday evening (local time) November 26. The following day we were at work. On Sunday evening there was a vigil service where we got our first real chance to “take it all in”. And there was much to take in! At the conclusion of the service there was a candle procession leading away from the outdoor stage that housed the alter towards the main church. It was dark by now, and when I say dark, I mean dark. There is absolutely no light pollution. Several times the power went out (the grids are understandably less reliable then we might be accustomed to). When this happened it was like you just closed your eyes. You could see absolutely nothing in front of, or around you. We are not accustomed to this, the people of Kibeho apparently are. Here is why I say that. I mentioned earlier that while we were setting up the equipment for the first time, we become quite the attraction for those around us. Throughout the night we developed a small following of children that stuck close by us as we moved around. A couple young boys offered to carry our equipment bags for us as we moved from place to place. Once darkness fell upon us and the lights began to go out, our new recruits reached out their hands to grab ours so we would know they were still with us and would not lose us. (Remember, I said is was too dark to see your hand in front of your face.) It is as if they were saying, “Don’t worry, I am still here, I won’t lose you.” This is the first moment I realized there was something very special about the people of Kibeho. As we made our way towards the main church we could see the thousands of people who had been there for days and had travelled as much as 100 miles on foot. Some walked 25 miles a day for four days to be part of this celebration. If that does not demonstrate faith and devotion, I don’t know what does. Inside the church another thousand or so were camped out. These were the early arrivers. They had cover from the rain. The others spent days outdoors with nothing but the clothes on their backs. While it never fell much below 70 degrees fahrenheit, it rained a little bit just about every day. Their clothes got wet and then the dried – all while they were being worn. Being this up close and personal to real material poverty has to be seen and felt to truly appreciated. Once inside the church we continued to have momentary power outages and yet that did not stop those inside from singing their hymns from the top of the voices – and there was a remarkable sense of harmony among the many voices. The vigil service had long ended and still their faith inspires them to keep singing. Yes, it was loud and yes it was breathtaking to listen to. The main service was on Monday. I am no expert on crowd size estimates and I will still confidently suggest that attendance was in the tens of thousands. There were people as far as the eye could see. Some have traveled from around the world. The service was about three and a half hours long. I won’t get bogged down in the service itself, yet I am compelled to share one part of the service that was very reflective. If you are familiar with Catholic services (perhaps in other denominations, this is ritualistic too) there is the presentation of the gifts which is the transition from the Liturgy of the Word to the Liturgy of the Eucharist. For those not familiar, these are the main bifurcations that compose a Roman Catholic Mass. During a typical service, these ‘gifts’ comprise two small cruets – one with water, the other other with wine, and also a crucible or ‘common cup’ with communion wafers. However, the gifts presented at this service go far beyond those of a typical service. Several dozen, if not several hundred people in the congregation brought donations from whatever meager belongings they had as gifts to the community. Think about this. People who had precious little to sustain themselves still made a point of finding something to offer up to help those less fortunate then themselves! That epitomizes absolute selflessness in my opinion. Contrast that with a society that is ever striving for riches and wealth seeks to harbor against the unfortunate who are often simply labeled as unwilling. There is more to the story of our few days in Kibeho and I will continue in a post later this week. With the Holiday Season upon us, we all have much to do and I appreciate that you took the time to read this. Soon, I will continue sharing my experience of the people and culture of Rwanda and then share my visits to two Rwanda Genocide Museums. In this photo I am geared up for the main service on Monday. The work we did for the documentary was voluntary. Air travel, lodging and most meals were covered. The only “pay” I received was the opportunity to be a part of it all. I was very well compensated! This link is the first video output from the trip produced by Patrick Dolan of Plymouth Filmworks whom I continue to be grateful for inviting me to assist him. I look forward to thoughts and comments. Thanks for reading, Have a Great Day! Life-long learner. Collaboration enthusiast. Avid cyclist. This entry was posted in Faith, Religion, Travel, Uncategorized and tagged catholic services, Faith, kibeho, marian apparitions, material poverty, Religion, roman catholic church, Rwanda, Travel. Bookmark the permalink.